We have had an amazing week! On Sunday (June 3rd, 2018) we hit 200,000 subscribers! I really appreciate all of you! We have a ton of interaction! You’re talking to each other, helping each other out, swapping ideas, asking amazing questions. It’s a wonderfully positive community. So thank you so much for being a part of it! We’re giving away a Lauten Audio LA320 Vacuum Tube Microphone! 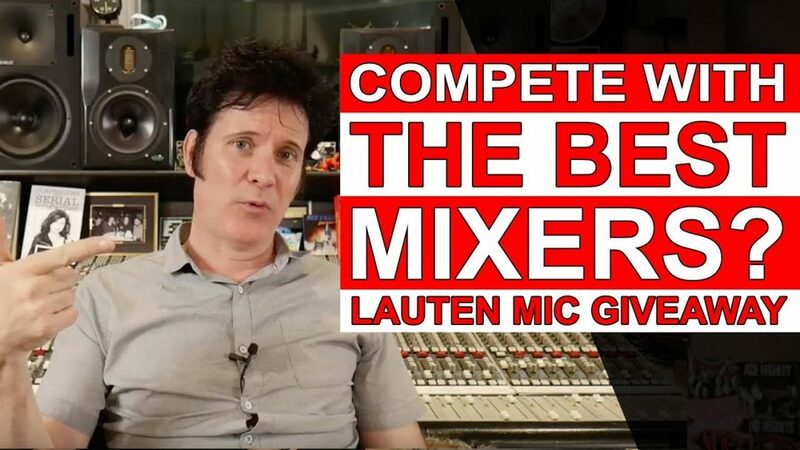 Why compete with the best mixing engineers? Graham our good friend over at Recording Revolution, has started off more producers, engineers and mixers in this business than probably anybody else. He is fantastic at cultivating and mentoring young up and coming people. He did a video recently called “Should you be a jack of all trades?” which is a very interesting discussion point. My answer to your question is YES and NO! If you have more budget than you could ever imagine and you can cherry pick the finest people in the world you’ll (more often than not) get incredible results. You’re going to increase the likelihood of getting a great sounding track if you hire an external mixer that also works in your genre, has tons of credits, and most importantly has really good sounding mixes. If you have a limited budget, which let’s face it is 99% of us, you’re going to have to learn a bit of everything. Take your time, enjoy the process, learn, get into our community! There are so many people that are willing to help! We have a wonderful supportive community here! I answer your all of the following questions in the video below! • Why compete with the best mixing engineers? • What’s the difference between using that phase tool and actually moving the sample forward in time? • General question, how much should we remove the dynamics of a performance? • Do you gate your toms? The Lauten Audio Series Black LA-320 large diaphragm vacuum tube condenser microphone is a professional and versatile microphone for studio and vocal recording. This microphone features a 1″ gold sputtered diaphragm with cardioid polar pattern, dual-triode vacuum tube, 120 Hz low-cut filter, 12 kHz high-cut filter, and transformer balanced output. The low-cut filter helps reduce boomy lows or low-end rumble; the high-cut filter helps to tame bright sources. These features help you to achieve excellent recordings regardless of your skill level.